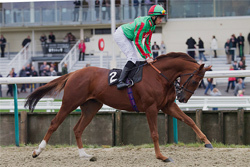 The racehorse, Democretes, a 5-year-old chestnut gelding and bred from Cadeaux Genereux and Petite Epaulette is trained by S. Durack and has been run (Flat) 25 times gaining 2 firsts, 5 seconds and 4 thirds. "I found the way in which Andrew responded to my initial enquiry and communicated throughout the process most impressive. Response times were quick and Andrew was very helpful in making suggestions on how to improve and build on the idea which I had in mind. The painting was done in plenty of time for the date which I needed it by, and I was really impressed with the quality of the finished piece, as was the recipient of the gift, for whom I had the painting produced. I would recommend Andrew to anyone looking for a good service and quality end product." 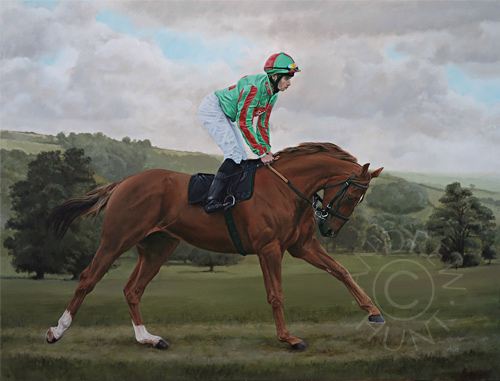 As the supplied photo of Democretes showed him against a rather busy and unattractive background, I suggested instead to set him on a grass gallop, with a countryside backdrop, giving the painting a more timeless feel.